The season of mellow fruitfulness is now upon us. I have a bag full of apples from my mother’s garden and blackberries abound in our Cornish hedgerows. Inevitably, a blackberry and apple crumble will make its way onto our early autumn dinner table. In truth, this time of year is just not complete without one. The humble crumble, is really the king of puds. It’s easy to make and can turn pretty much any seasonal fruit into a melting, comforting bowl of deliciousness. A dollop of Cornish clotted cream or a spoonful of warm homemade custard completes this most classic of British puddings. This blackberry and apple crumble is our first of the season. It’s spiced with warming ginger and includes walnuts in the crumble topping for additional taste and texture. I used blackberries from a foraging expedition last week, which I’d frozen for just such an occasion. I’ve only recently figured out the secret to freezing berries. I used to just bung all my berries in a bag and stick them in the freezer. They always come out a gungey mess. To be honest, that doesn’t really matter for puddings such as blackberry and apple crumble or for jam making, but recently, I’ve just been wanting a few individual berries to add to my smoothies. I now, freeze the blackberries on a tray in a single layer for just half an hour, before placing them in a bag. This way they remain as individual berries – much more aesthetically pleasing. It should come as no surprise, but I always use wholemeal or spelt flour for my crumble topping. This not only ups the nutritional content of the pudding, but it gives an additional nutty flavour which I really like. Even my friend Andy, who considers himself something of a crumble expert, reckons my crumbles are up there with the best. I like my fruit to err on the sweet rather than tart side, but only just. You may need a bit more sugar if your apples are very acidic or a bit less if you prefer more tartness in your tart. If the apples are organic and in good condition, I like to keep the peel on. As long as the blackberry and apple crumble is well cooked, the peel isn’t that obvious and it’s a shame to waste such a nutritious part of the fruit. This recipe can easily be scaled up to feed more people. Seasonal comforting blackberry and apple crumble. This one's spiced with warming ginger and includes walnuts in the crumble topping for additional taste and texture. Rub the butter into the flour and ground ginger until the mixture resembles breadcrumbs. Stir in 20g of the sugar, the walnuts and crystallised ginger. Wash, quarter and core the apple, but leave the peel on if it's organic and in good condition. Slice finely and lay in the bottom of a small buttered pie dish. Scatter the blackberries over the top followed by the remaining sugar. Spoon the crumble topping over the top and bake for 25 minutes at 180℃ or until the top has browned and the fruit is cooked. You will need more time if you are making larger quantities. More sugar may be required if the apples are particularly tart. Best accompanied by clotted cream or warm custard. Scale up the recipe for larger quantities. I’m sending this blackberry and apple crumble off to Katie at Feeding Boys for Simple and in Season. This blackberry and apple crumble is one of several organic recipes I’m posting for #OrganicSeptember, which is all about making small changes this year. The apple I used was a windfall and needed using quickly before it bruised and spoiled, so this goes to the No Waste Food Challenge at Elizabeth’s Kitchen Diary. If you make this blackberry & apple crumble, I’d love to hear about it in the comments below or via social media. A photo is always good too. For more delicious and nutritious recipes, follow me on Twitter, Facebook, Instagram or Pinterest. 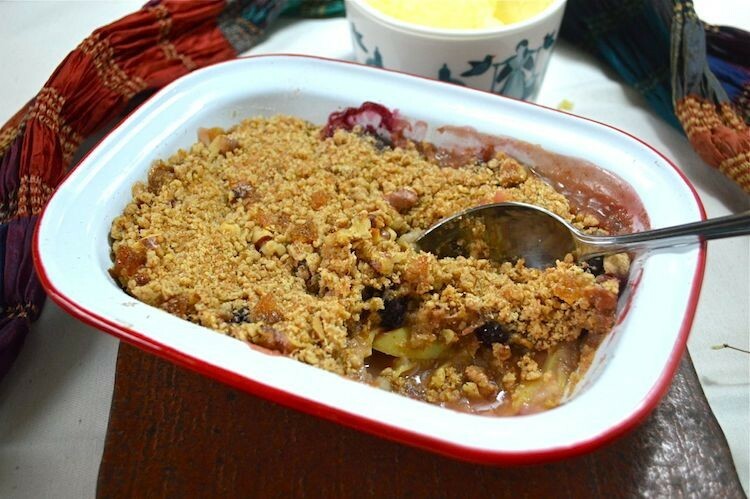 Yum, just love crumble and the addition of ginger is perfect! Haha yes, how could you not approve? Mmm the topping looks wonderful with the spelt flour, walnuts and ginger, this sounds delicious. I need to get foraging! Who doesn’t love a humble crumble? I often keep bags of crumble mix and fruit in my freezer so I can chuck one in the oven any moment for easy home made comfort pudding. Now that is an excellent idea Sarah. I do wish I could get more organised. We are fans of crumble :-)) Love the addition of crystallised ginger in awesome recipe. Thanks Angie. Crumbles are such perfect comfort food. Thanks Katie. I can’t resist adding extras to my crumble toppings. Thanks Nadia. Fruity desserts weren’t my favourite when I was young either, so a maturing palate must surely be a “thing”. Or even clotted cream Jill? Thank you, there’s a reason why crumble is such a favourite pud. If there’s crumble to be had, then it MUST be Autumn! The most comforting pud on the planet…. for sure. Nice addition of ginger and walnut…. I have a real thing for walnuts right now…. in fact I get a real thing for walnuts this time every year! Ah, you were lucky Kate. We used to freeze masses of fruit when I was young, but we never discovered this method. Much more elegant. Now autumn I’ve accepted that Autumn is actually here, I’m embracing it – just need to find some fresh walnuts. I adore the idea of adding ginger I am going to try this as I love ginger spice very much. I often add ginger to my crumbles. It goes brilliantly with rhubarb too. O that’s lovely! The ginger adds that perfect spice and I just love fruit crumbles! Mmm I’m loving the sound of this! So wonderful to have wild fruit to use too. Thank you for sharing with the No Waste Food Challenge! Thanks Elizabeth. I grew up with blackberries all around in the hedgerows (and our garden) and sometimes forget not everyone has such easy access to them.